Louisiana 4.5 Percent Unemployment Among Lowest In U.S. The preliminary figures from The Bureau of Labor Statistics show Louisiana has a low unemployment rate of 4.5 percent, compared to the US rate of 6.3 percent, as of April 2014. Forty-three states had unemployment rate decreases, two states had increases, and five states had no change. The national jobless rate fell to 6.3 percent in March and was 1.2 percentage points lower than in April of last year. The largest monthly increases in employment occurred in Texas (+64,100), California (+56,100), and Florida (+34,000). The largest monthly decrease in employment occurred in Illinois (-6,800), followed by Minnesota (-4,200) and Maine (-2,200). The largest monthly percentage increases in employment occurred in Alaska, Colorado, and Texas (+0.6 percent each), followed by the District of Columbia and Hawaii (+0.5 percent each). The largest monthly percentage declines in employment occurred in Maine (-0.4 percent), Wyoming (-0.3 percent), and New Mexico (-0.2 percent). Over the year, nonfarm employment increased in 48 states and the District of Columbia and decreased in 2 states. The largest over-the-year percentage increase occurred in North Dakota (+5.2 percent), followed by Nevada (+3.8 percent) and Florida (+3.3 percent). The only over-the-year percentage decreases in employment occurred in New Mexico (-0.7 percent) and Virginia (-0.1 percent). 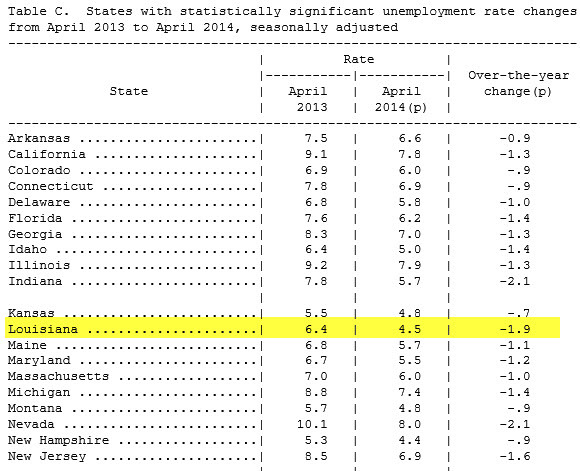 Louisiana’s unemployment rate fell from 6.4 percent to 4.5 percent for the last 12 months ending April 2014. In April, the West continued to have the highest regional unemployment rate, 7.0 percent, while the South again had the lowest rate, 5.9 percent. Over the month, all four regions had statistically significant unemployment rate declines: the Midwest and Northeast (-0.3 percentage point each), West (-0.2 point), and South (-0.1 point). Significant over-the-year rate decreases occurred in all four regions: the Northeast (-1.4 percentage points), South (-1.3 points), and Midwest and West (-1.1 points each). Rhode Island had the highest unemployment rate among the states in April, 8.3 percent. 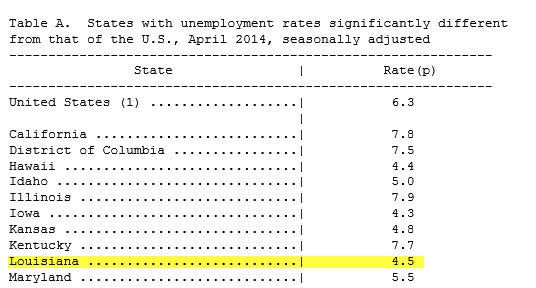 North Dakota again had the lowest jobless rate, 2.6 percent. In total, 19 states had unemployment rates significantly lower than the U.S. figure of 6.3 percent, 7 states and the District of Columbia had measurably higher rates, and 24 states had rates that were not appreciably different from that of the nation. The Metropolitan Area Employment and Unemployment news release for April is scheduled to be released on Wednesday, May 28, 2014, at 10:00 a.m. (EDT). The Regional and State Employment and Unemployment news release for May is scheduled to be released on Friday, June 20, 2014, at 10:00 a.m. (EDT).